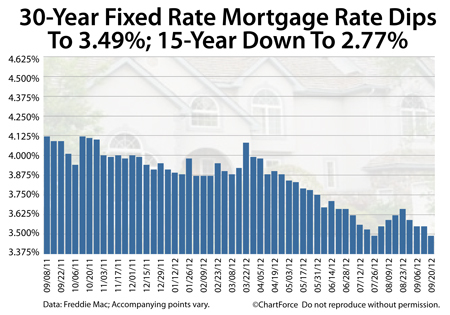 According to Freddie Mac’s weekly Primary Mortgage Market Survey, the average 30-year fixed rate mortgage rate fell 6 basis points to 3.49% this week, tying the all-time low set in late-July. The 15-year fixed rate mortgage also dropped, moving to 2.77%. This, too, marks an all-time low. The Federal Reserve’s plan to pressure mortgage rates down may be working. However, depending on where you live, your access to these all-time rates may be limited. This is because the Freddie Mac “published rate” is a national average based on the government-backed group’s survey of more 125 banks. Mortgage rates can vary by region. For example, this week, mortgage applicants in the West Region are most likely to get the lowest rates of anyone. In the West Region, 30-year fixed rate mortgage rates are averaging 3.43 percent with an accompanying 0.6 discount points. By contrast, applicants in the Southeast Region are most likely to get the highest rates with the 30-year fixed rate mortgage is averaging 3.53% with an accompanying 0.7 discount points. 1 discount point is a fee equal to one percent of your loan size. Loans with more accompanying discount points pay higher total closing costs. Over the past 12 months, this 60-basis point mortgage rate improvement has increased the maximum purchase price of a Franklin home buyer by roughly 7%. Home prices, however, may soon catch up. Earlier this week, the Census Bureau reported Housing Starts at a multi-year high and the Existing Home Sales report from the National Association of REALTORS® showed the same. Housing is in recovery and prices are on an upward trajectory. Take advantage of low mortgage rates while they last. Talk to your loan officer today.